In the United States, about 7 million people have undiagnosed diabetes, representing nearly one-fourth of all diabetes cases. Approximately 35% of adults aged 20 and older—or 79 million Americans—have prediabetes, a condition in which patients have blood glucose levels higher than normal but not high enough to be classi­fied as diabetes. These people are at increased risk of developing type 2 diabetes, heart disease, and stroke. “Clinicians should have a high index of suspicion for undiagnosed diabetes in people who are older, obese, physically inactive, or have a history of abnormal glucose tolerance, including gestational diabetes,” explains Robert E. Ratner, MD. Those with hypertension, dyslipidemia, and a family history of diabetes are also at high risk. Furthermore, racial and ethnic minorities have been shown to be at greater risk for diabetes. In people with these risk factors, periodic glucose testing should be performed to evaluate their dia­betes status. 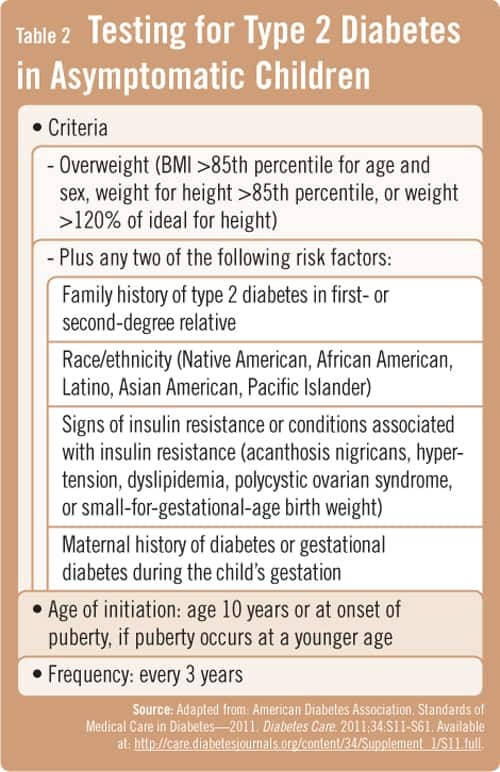 The American Diabetes Association provides criteria for testing for diabetes in asymptomatic undiagnosed adults (Table 1). Testing should be considered in adults of any age who are considered clinically over­weight (based on BMI) and have one or more known risk factors for diabetes. Testing of people without other diabetes risk factors should begin no later than age 45, according to the American Diabetes Association, because age has been identified as a major risk factor for the disease. The A1C, fasting plasma glucose, and 2-hour oral glucose tests have been deemed appropriate diabetes tests for asymptomatic and symptomatic individuals by the American Diabetes Association. These tests can give clinicians a good indication of who has diabetes or prediabetes. Abnormal results should trigger regular follow-up and discussion with patients. Kahn R, Alperin P, Eddy D, et al. Age at initiation and frequency of screening to detect type 2 diabetes: a cost-effectiveness analysis . Lancet. 2010;375:1365 – 1374. Tuomilehto J, Lindström J, Eriksson JG, et al. Finnish Diabetes Prevention Study Group . Prevention of type 2 diabetes mellitus by changes in lifestyle among subjects with impaired glucose tolerance . N Engl J Med. 2001;344:1343 – 1350. Diabetes Prevention Program Research Group. 10 year follow-up of diabetes incidence and weight loss in the Diabetes Prevention Program Outcomes Study. Lancet. 2009;374:1677-1686. Johnson SL, Tabaei BP, Herman WH . The efficacy and cost of alternative strategies for systematic screening for type 2 diabetes in the U.S. population 45–74 years of age . Diabetes Care. 2005;28:307 – 311. Financial Disclosure: Robert E. Ratner, MD, has indicated to Physician’s Weekly that he has received research support from Bayhill Therapeutics, GlaxoSmithKline, Halozyme, Integrium, sanofi-aventis, Shionogi, and Veralyte. He has also worked on advisory boards for Amylin, AstraZeneca, Novo Nordisk, and sanofi-aventis, and has stock ownership in Merck, Johnson & Johnson, and Abbott.